At exactly 7.28 a.m. in France on Friday 1 July 1916, Frank John Preece, his fellow soldiers in the Queen Victoria’s Rifles and 332,000 other British, French and Commonwealth soldiers, went over the top towards a supposedly decimated German front line. DWP’s Adam Lilley describes how he and hundreds of other volunteers commemorated the events of a century ago. After a week-long artillery barrage, with over 1,700,000 shells fired, the Allied generals expected troops to walk unopposed towards deserted trenches. Within moments of the whistles being blown, it was clear this was not the case and wave after wave of machine-gun fire sprayed over no-man’s-land. By the end of 1 July 1916, the first day of the Battle of the Somme, the Allied armies had suffered almost 60,000 casualties in a battle that would eventually claim a million casualties in all. On 1 July this year, amid the widely publicised centenary commemorations for the Somme, I and 1,500 other volunteers in First World War-era uniforms began quietly moving through stations and cities around the UK. At each location we stood resolutely in silence, every one of us carrying cards with a name, regiment and the date ‘July 1 1916’, and the single instruction that this should be handed to anyone who took an interest in us. #WeAreHere soon became the top trending topic on Twitter and the message got out that this was in memory of those who’d died on the first day of the Battle of the Somme. 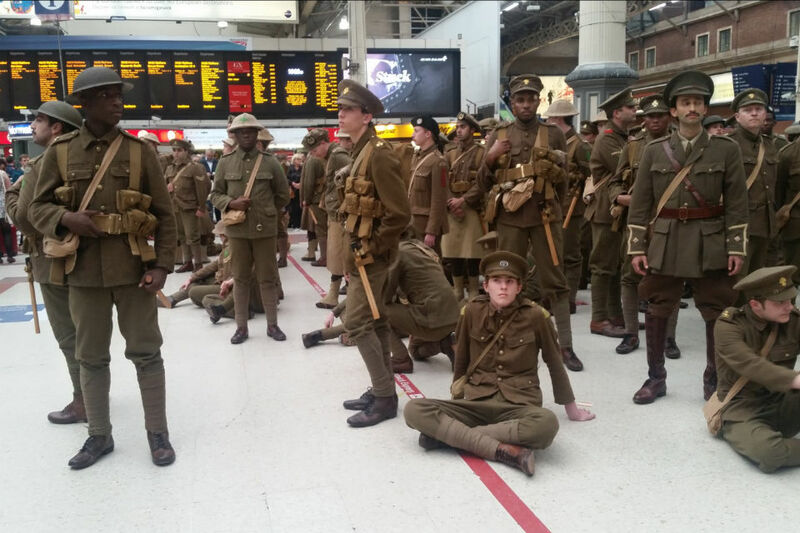 The whole project was the brainchild of Jeremy Deller and Rufus Norris, who together created #WeAreHere. At the end of the war, there were numerous reports of people glimpsing relatives and friends who had died during the war in public spaces, only for them to disappear on a second glance. These ‘ghost soldiers’ were unsettling and upsetting for those who so desperately longed for their lost loved ones to return from the Front, and it was from these stories that #WeAreHere was born. Each of us would be a fallen soldier and stand silent in their memory. I represented Frank John Preece and alongside hundreds of other volunteers, spent eight weeks rehearsing in secret to create this 'living art' project. Having studied the First World War at school and visited Thiepval, I have seen the endless gravestones and casualty lists, but something about commemorating a specific soldier brought all of that into sharp relief. Frank was a real person. 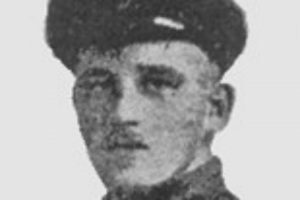 Aged 21, five years my junior, he left Twickenham, crossed the Channel, climbed out of the trenches and died on the battlefield of the Somme. During #WeAreHere, I led our line of soldiers and later followed from the rear. At the front, you saw people’s initial reaction, but at the back, you heard it. It was listening to those snippets of conversation and the stories of people’s own families’ involvement in the war that was most moving about the day. My own great-great-grandfather, Robert Dan Bird, fought at the Somme in the Royal Warwickshire Regiment. He was injured and transferred to the Labour Corps, but ultimately survived to work as a decorator and later father six children. According to family legend, during the battle, he was blasted against barbed wire by an exploding artillery shell and remained trapped in no-man’s-land for two days – an experience that he never truly recovered from, nor spoke about openly. Almost no household in Europe escaped the devastation of the First World War, which saw 40 million casualties in 4 years. The Somme remains one of the bloodiest battles in human history, and accounts for the single biggest loss of life during the war. As an onlooker at the commemorations said, it demonstrates the need for remembrance and more than justifies the special status it still holds. 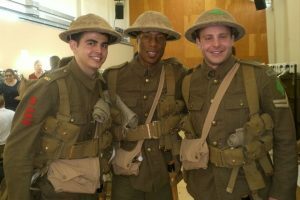 If you want to see and learn more about #WeAreHere, the National Theatre has created www.becausewearehere.co.uk. Adam, thank you for being one of the men who took part in this, it was an absolutely inspired idea which had commuters and shoppers compelled on the day. I saw the 'ghost soldiers' at Liverpool One shopping centre in my lunchtime, and they were amazing. Their acting was of such high quality - it was like the 'soldiers' had come back to see what they had died for. What was very upsetting too was it being brought to life just how young the actual soldiers were. During the couple of minutes that I looked at the men, I felt more connected with what had happened in WW1 than I had ever been through reading books at school or seeing TV programmes about it. Just incredible. Thanks again. Thanks Alex, none of us, even the artist who conceived the project, had any idea how strong a reaction we would get from the public. It was extremely hard at times not to show sympathy with onlookers, especially when they would tell you very personal stories about their own family history. I wish I had been able to see the ghost soldiers in person but it was an incredible thing to do and really brought the commemoration to the fore. Thank you. #WeAreHere - so incredibly moving. Anything WW1 related is always guaranteed to bring me to tears - the sheer scale of loss of young life is just unbearable. #WeWillRememberThem. Every Gordon Highlander battalion was at the Somme - 9,000 of them died and 20,000 were wounded but thankfully my grandfather who was badly wounded survived ( I would not be here otherwise) He told me it was ignorant slaughter and in his small village in the North East of Scotland every family seemed to have suffered a loss. This memorable event would have made his day. Adam, I'm fascinated by how this brilliant project was brought to fruition in secret. How were you and your fellow volunteers recruited? Hi Helen - we were recruited through an advert for 'Project Octagon' (there's quite a bit of that hashtag on twitter too), for what was billed as a 'national commemorative event’, but had absolutely no detail other than 'you must be comfortable performing in public'. They’d also done some recruiting through the National Youth Theatre, but there was a whole mix of people from all sorts of backgrounds. Next time you see an obscure and mysterious advert - just apply for it, you never know what special story you might get caught up in! Adam thank you! I came across the ghost soldiers in Manchester Arndale. They all started to sing and I'm afraid I had to move away as I could feel the tears coming to my eyes. Such a moving tribute. A tremendous project, inspired and richly rewarding. However, it is easy to get carried away with statistics - " A battle which ultimately claimed a million lives" - No, total British fatalities during the Battle of the Somme amounted to 125,000, Germany approx 200,000, France 80,000. ( it is difficult to be precise with German and French figures as they calculated casualties differently to the British ) I think you may be mixing this up with casualties ( killed, wounded, missing or P.O.W ), which amounted to approx 1,250,000 on all sides. Not to belittle the loss, simply to put it into perspective. Ed, you're correct, I misread 'losses' for 'deaths' and they're going to update the blog. But as you say, the scale of destruction was simply enormous and it was a privilege to play a small part in commemorating the Somme and represent someone who died there. I wish I could have seen this. Congratulations to all that took part and I am touched to see that World War 1 is still in the public consciousness. Fantastic, my Great Grandfather fought with the 36th Ulster Division, was injured in a gas attack and then attached to the 109th Brigade for the rest of the War, came home and got on with it. Should do it every year. I am sad but also glad that I did not see this tribute, I know I would not have been able to hold back the tears. Even reading this article has upset me, such a waste of life. God bless them all. Just seen this - Adam, fantastic fella. My (tin) hat is in the sky, I had no idea you were involved. Amazing. Well done, and great work. I had the privilege of seeing the 'ghost soldiers' in Glasgow just marching along the street in silence. The air of silence and reverence around all on a busy street at lunchtime was incredible. Well done to all involved in this.